Check out our coordinating papers, elements, and alphaset paks! Celebrate school days, graduation, seniors, art journaling, heritage or boy stuff with this creative journal set. 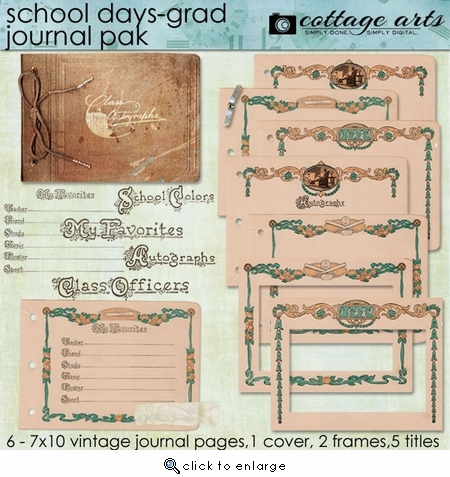 This Journal Pak includes 6 - 7x10 (approximate size - 4 blank, 2 with word art prompts) vintage autograph pages, accompanying autograph journal cover, tape, fastener, 2 frames, and 5 word art titles for you to build your own school days album. The journal cover and pages can also be printed for altered art projects. We can't wait to see what you create with them! All pieces come with no drop shadows.